Determine your golf handicap and figure out what areas you can focus on to see the most improvements. As a golfer and a techie geek, I’m always interested in gizmos that marry the two together. 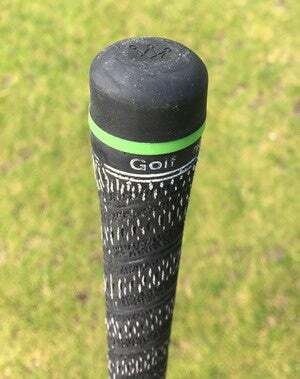 A few years back, I wrote about GolfSense, which uses a sensor on your golf glove and an app on your iOS device to track your swing on the driving range. A more recent entrant in the geeks-and-golfers segment is Arccos Golf, which is also a physical sensor and iOS app combination. Arccos, though, uses 14 sensors—one for each club, and is designed for use while you’re playing, not while on the range. The Arccos sensors screw into the top of each club; once installed, they almost look like part of the club. I never noticed them while swinging. 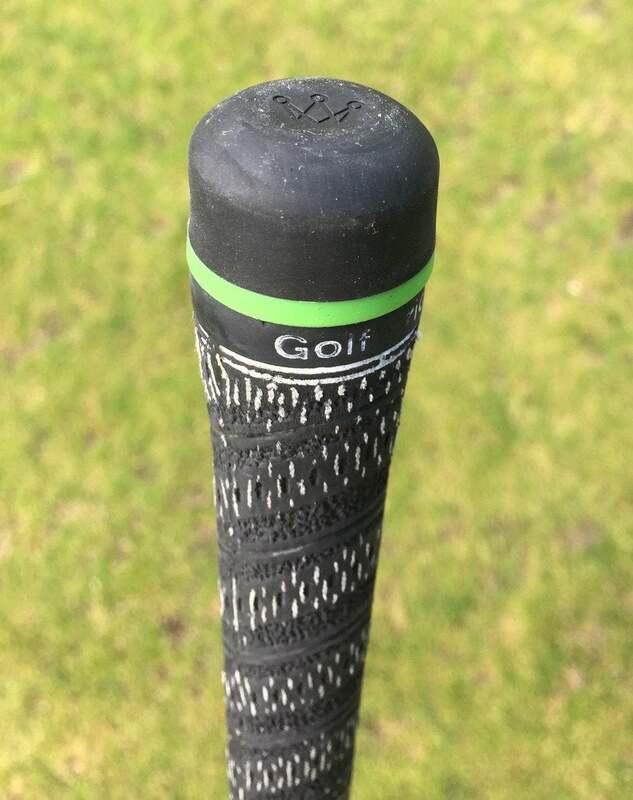 The sensors are very tiny and light (10 grams each), and screw into the hole in the grip at the top of each club. Each sensor links to your iOS device via Bluetooth. The installation and pairing process is relatively straightforward, if a bit monotonous—you first install all 14 sensors, then pair each to the iOS app, one after the next. Once installed, the sensors look natural and I didn’t notice them at all while swinging. Unlike GolfSense, which is concerned with your swing, Arccos tracks what happens after you swing: How far did the ball go, which direction did it go, and how many times did you hit in on each hole. There are GPS scoring apps that will do this, too, but they require you to input which club you hit, and start/stop tracking to get the distances. The beauty of the Arccos system is that it knows which club you hit, because each sensor is paired to a specific club. It also knows where you hit the ball, because it can sense (through an impact sensor) each shot on a hole. So it simply measures the GPS distance between two shots to get the first shot’s distance. It does this all automatically; you just play golf, paying no mind to the sensors. One hole from one of my rounds; Arccos can display a map like this for any hole on any course you’ve played with the sensors installed. And yes, it wasn’t a great chip and I left with a par. Because Arccos knows which clubs you hit, where you hit them, and how far each shot went, it can track every shot of every round, and display them on a map. 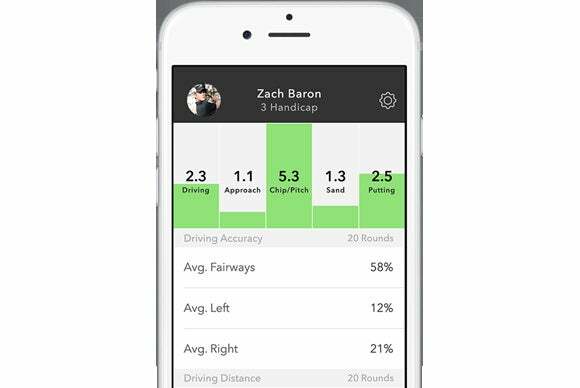 By the end of each round, Arccos knows how many shots you hit with each club, how far each went, and whether they wound up in the fairway, on the green, or in a sand trap. It uses this data to generate an official handicap. 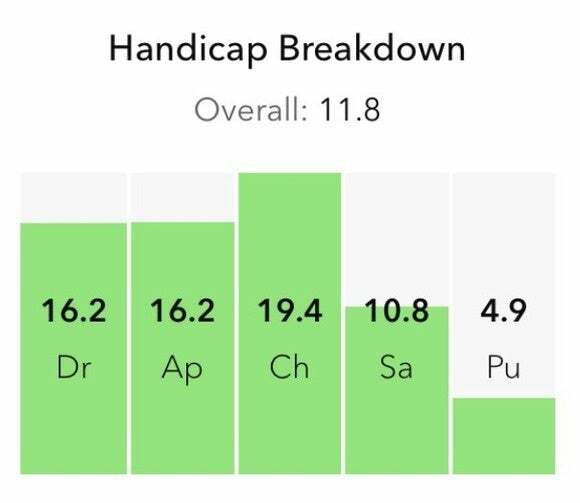 But where the system really shines is its analysis of that handicap: it shows you how your handicap breaks down by drives, approaches, chips, sand shots, and putts. If a given area has a higher score than your handicap, then you’re doing worse than you should be. Similarly, a lower score means you’re doing better than your handicap indicates. This can really help you zero in on the areas that need attention. The web-based dashboard (also available in the iOS app) has a ton of additional information: breakdowns of each round, number of shots with each club, variance from average yardage per club, greens hit in regulation with each club, etc. It’s a data geek’s dream. My overall Arccos handicap is 11.8. Notice, though, that Ch (chipping) is much worse than that, and Pu (putting) is much better. To improve my score, I should work on chipping. Because the sensors record impacts, if you tamp down repaired ball marks with your putter, you may find Arccos recording a lot of putts. Thankfully, it’s pretty easy to delete extra shots. I found the Arccos system easy to use—because it just works. Launch the app and play; it doesn’t get much easier than that. The statistics are very useful for figuring out what areas of your game need attention, either through practice on your own or lessons. Personally, I found it so useful that after returning the review unit, I bought one of my own. I guess that’s a pretty strong recommendation, isn’t it? If you play a lot of golf and want to get better, Arccos Golf is a reasonable investment for determining what areas of the game you should work on.